Ice Hockey - 07. November 2018. 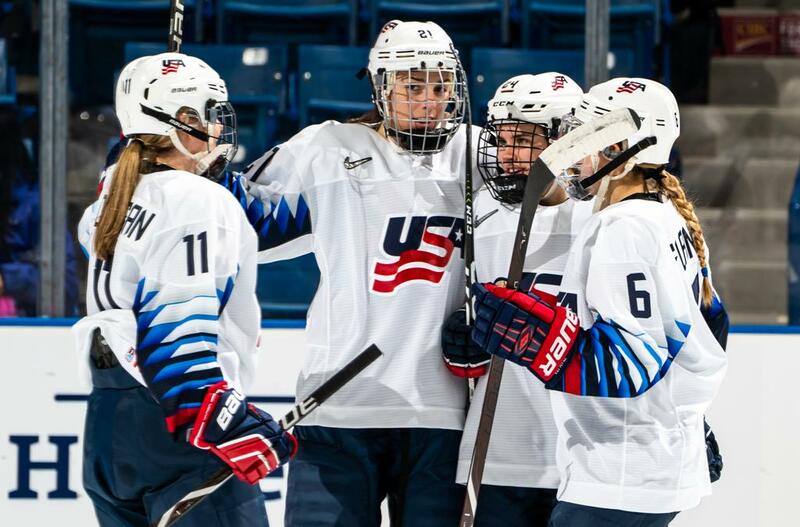 The U.S. Women's National Team scored five unanswered goals in the second period and 11 players registered points to power the U.S. past Finland, 5-1, here today in the opening game of the 2018 Four Nations Cup at SaskTel Centre. "I thought we built as the game went on," said Bob Corkum, U.S. Women's National Team head coach. "We had a good first 10 minutes of the second period and played the way we wanted to. We're just looking to build one day at a time." The U.S. went on the power play early, creating a scoring chance just 5:02 into the period when Hannah Brandt (Vadnais Heights, Minn.) sent a pass through traffic to Kacey Bellamy (Westfield, Mass.) in the right face-off circle. Bellamy ripped a shot on Noora Raty and followed up for the rebound, but both attempts were stopped by the Finnish netminder. Finland broke the ice 8:01 into the first when Emma Nuutinen's shot from above the hash deflected in off a U.S. defender for a 1-0 lead. With 5:41 remaining in the first period, Caitrin Lonergan (Roslindale, Mass.) won the puck from a Finnish defender at the blue line to create a two-on-none advantage. Lonergan passed to Annie Pankowski (Laguna Hills, Calif.) streaking down the left wing and she sent it back across to Lonergan for the shot, but she was stopped again by Raty. The U.S. got on the board just 13 seconds into the middle frame when Brianna Decker(Dousman, Wis.) went top-corner on Raty with a shot from the left face-off circle. The play started in the neutral zone when Kendall Coyne (Palos Heights, Ill.) fed a pass to Decker on the offensive blue line to even the score at one apiece. The U.S. struck again 5:21 into the period when Cayla Barnes (Eastvale, Calif.) banged home a one-timer from above the crease on a pass from Megan Keller (Farmington Hills, Mich.) to give the U.S. a 2-1 lead. Just one minute later, the U.S. tripled its advantage when Dani Cameranesi (Plymouth, Minn.) fired a shot from the half wall that was deflected in by Hilary Knight (Sun Valley, Idaho). Sydney Brodt (North Oaks, Minn.) increased the U.S. lead to three when she one-timed home a pass from Decker in the left face-off circle with 8:28 remaining in the second period. With 2:02 left in the period, Brandt connected with Cameranesi on Raty's far post to tally the U.S.'s fifth goal of the frame. With no goals scored in the final period, the U.S. held on to win the contest, 5-1. Maddie Rooney (Andover, Minn.) made nine saves in net for Team USA. The U.S. Women's National Team (1-0-0-0/W-OTW-OTL-L) will continue preliminary round play tomorrow (Nov. 7) when it takes on Canada. Puck drop is set for 7 p.m. local time/8 p.m. ET and the game will be streamed live on HockeyTV.com.